Bhubaneswar: The World Population Day is observed on 11th July every year all across the globe. It was inspired by the public interest in Five Billion Day on July 11, 1987. It is being observed in India as well as in our state every year with focus on addressing Family Planning and Population Issues. The State level ceremony for observance of World Population Day was held here today. State Health & Family Welfare and Law Minister Shri Pratap Jena graced the occasion as chief guest. Among others Mission Director, National Health Mission, Odisha Smt. Shalini Pandit, Director of Family Welfare Dr Binod Kumar Mishra and Jt. Director (Family Welfare) Dr. Ajit Kumar Mohanty also attended the ceremony. Minister Shri Jena felicitated and awarded Nuapada, Malkangiri and Gajpati as best three districts for family planning performance on sterilisation operation during 2016-17 and Rayagada, Koraput and Nuapada districts were also awarded for best performance in conducting Vasectomy operation during 2016-17. Koraput and Malkangiri districts were awarded for providing quality family planning services during 2016-17 and Kandhamal and Mayurbhanj districts were felicitated for best performance in PPIUCD insertions. Similarly, Dr. Rabindra Nath Mishra of Jajpur district and Dr. Sujnanendra Mishra of Bolangir were awarded for best performance in conducting minilap operation during WPF-2016. Among others, health workers, ASHA workers, Surgeons, ANM and NGO from 14 districts were also felicitated and awarded on the occasion for their inspiring performance in the sector in 2016-17. This year World Population Day is being observed with launching of ‘Population Stabilisation Fortnight’ or ‘Janasankhya Sthirata Pakshya’ from 11th to 24th July, 2017 preceded by a ‘Mobilisation Fortnight from 27th June to 10th July 2017’ in the entire state. This year’s global theme is “Family Planning: Empowering People, Developing Nations”. Access to safe, voluntary family planning is a human right. It is also central to gender equality and women’s empowerment, and is a key factor in reducing poverty. Investments in making family planning available also yields economic and other gains that can propel development forward. Around the world, some 225 million women who want to avoid pregnancy are not using safe and effective family planning methods, for reasons ranging from lack of access to information or services to lack of support from their partners or communities. Most of these women with an unmet demand for contraceptives live in 69 of the poorest countries on earth. Population stabilisation movement in Odisha was revitalised in the year 2010, and our state has significantly improved the family planning services delivery, both in quality and quantity since then. A steady increase in acceptance of different family planning methods from 2010-11 to till date speaks about the volumes of sincere efforts that have been put in by the health machinery all across the state in order to provide uninterrupted family planning services to the people of Odisha. Odisha’s progress in family planning programme during last couple of years has been quite encouraging which is evident from NFHS-4 (2015-16) and SRS-2015 data source. Our unmet need has come down to 13.6% (NFHS-4, 2015-16) from 16.0% (NFHS-3, 2005-06) and the TFR (total fertility rate) has reached 2.0 (SRS-2015) which is lesser than the national average that stands at 2.3. • Popularising ‘Parivar Kalyan Diwas’ on fixed days wherein all the family planning services including counseling are being made available to the eligible clients in most of the health facilities both at district and sub-district levels which has widened the service coverage network. • District specific family planning plans (FP2020 Roadmaps) have been devloped in line with the practice of differential planning supported by development partners as part of the Vision FP2020 whereby an attempt is being made to design need-based FP interventions fitting into the requirement of each district thereby making implementation more effective and result-oriented. • Going for extensive capacity buidling of the service providers and effective deployment of the available family planning manpower for making quality sterilisation and long-acting spacing services easily availble to the target audience. • Empahsizing on promoting male enegagement in family planning as an attempt to reduce gender disparities and motivating men to perform gretaer and more active role in reproductive health related decissions and practices. • In order to address the bottlenecks in the supply chain system, Deptt. of H & FW has implemented state specific supply system innovation namely “Reproductive Health Commodidties Logistics Management Information System” (RH-CLMIS), an SMS-based System supported by UNFPA which has effectively managed to streamlining the supply system from state level upto the sub centre level in an attempt to ensure contraceptive security to all the target couples. Buoyed by the success of this intervention, measures are being undertaken to scale it up in urban areas under NUHM (National Urban Health Mission) programme. • Focusing on promoting Post Partum Family Planning (PPFP) Services among mothers delivering babies in the Govt health facilities wherein optimally utilising the opportunity of high institutional deliveries thereby providing more and better options to eligible mothers to regulate their fertility. I believe this progress will certainly lead Odisha to reach the goals of protecting additional 19 lakh new women by family planning methods over and above the existing 32 lakh women already protected by contraceptive services as part of Vision FP2020. • AS part of the State Governmnet’s Commitment to protect the ‘Reproductive Rights’ of the people, comprehensive measures have been undertaken in ensuring ‘Quality of Care’ while providing Family Planning Services in our Health Facilities. Orientation of health care providers includning medic and paramedic staff have been undertaken as directed by the Hon’ble Supremem Court. • This year’s plan includs various interventions to increase the numbers of ‘fixed day static centres’ so as to expand the ambit of sterilisation services to promote limiting methods, that ultimately contributes to population stabilisation. • Launching of newer contraceptives such as Centchroman (Chhaya), POP (progestin only pills) and Injectables (Antara) has indeed widened the basket of choices for eligible clients and provided more and better options to exercise their repproductive rights. 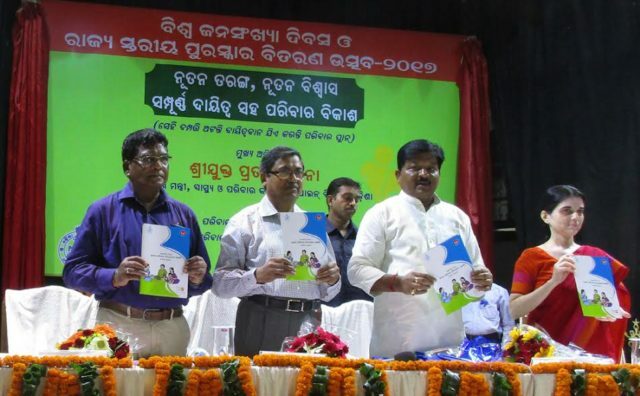 o More than 45,000 ASHAs are engaged in promoting informed choices to the eligible couples in the community by providing both home based family planning counseling services and delivering non-clinical contraceptives in an attempt to address the unmet need for spacing in Odisha. This intervention particularly helps the young couples and newly married couples to get contraceptive security thereby reducing unmet need in spacing significantly. This is an initiative meant to encourage every public health facility to work towards standards of excellence to help the facilities stay clean and hygienic. This does not apply only to physical cleanliness, but to develop and put in place systems and procedures for activities such as bio-waste disposal or protocols etc. The initiative towards total “Swacchta” in public health facilities is aimed towards building confidence of the users in public health facilities, provide quality services and encourage team work which in turn brings in positive health outcomes. Kayakalp Award is given to those best performing public health facilities that demonstrate high level of cleanliness, hygiene and infection control. In the year 2016-17 all 32 DHHs, 27 SDH & 377 CHCs were taken up for this competition.  In the DHH category: 1st prize goes to DHH Sambalpur and 2nd prize to City Hospital Berhampur (DHH Ganjam). And the Commendation Award goes to 6 DHHs namely DHH Kalahandi, Capital Hospital, Bhubaneswar, Koraput, Mayurbhanj, Nabarangpur, Balasore based on the marks secured.  In the CHC category: 1st prize goes to CHC Ghatagaon, Keonjhar and 2nd prize goes to CHC Mandasahi, Jagatsinghpur. The Commendation Award goes to 10 SDH/CHCs namely CHC Kesinga, SDH Rairangpur, SDH Baliguda, SDH Karanjia, CHC Jashipur, CHC Soro, CHC Gudari, CHC Bahalda, SDH Nilagiri, CHC Mahanga based on the marks secured.  DHH category: 1st prize went to Koraput, 2nd prize goes to Kalahandi and Commendation prize goes to Sambalpur districts based on the marks secured.